2 She didn’t come to my party yesterday. I am sure she forgot my birthday. Sam is late. Perhaps he missed the bus. He didn’t buy the coat he liked. Maybe he didn’t have enough money to buy it. 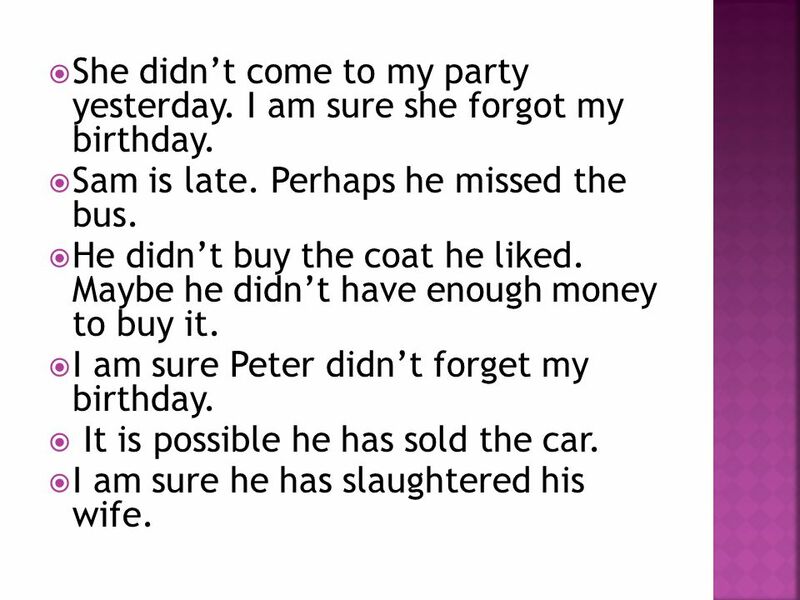 I am sure Peter didn’t forget my birthday. It is possible he has sold the car. I am sure he has slaughtered his wife. 3 I am sure she didn’t steal the money. I am sure he didn’t spend his last vacation at the seaside. It was foolish of you to mention it to him. I am sure he didn’t pay them. I'm not sure whether they have torn the house down. It's possible he was fined for speeding. They certainly met the deadline. 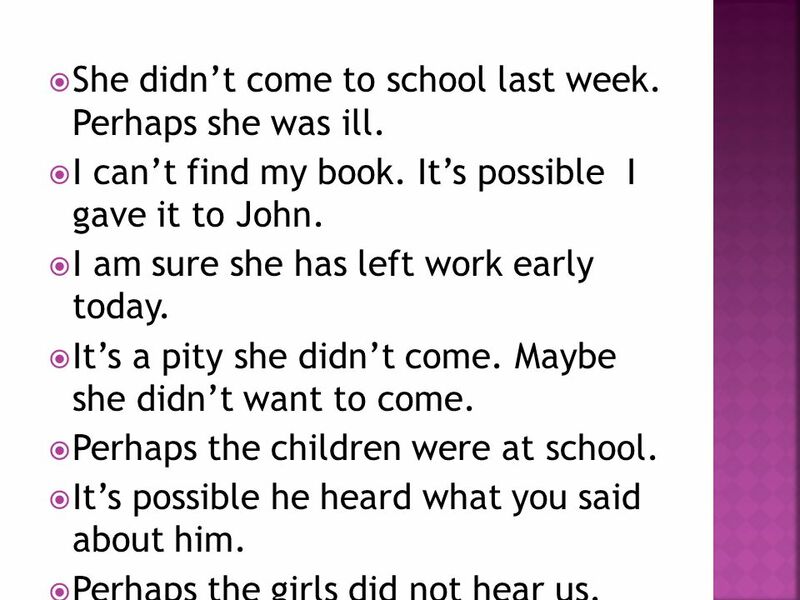 4 She didn’t come to school last week. Perhaps she was ill. I can’t find my book. It’s possible I gave it to John. I am sure she has left work early today. It’s a pity she didn’t come. Maybe she didn’t want to come. Perhaps the children were at school. It’s possible he heard what you said about him. Perhaps the girls did not hear us. 5 Perhaps the girls did not hear us. 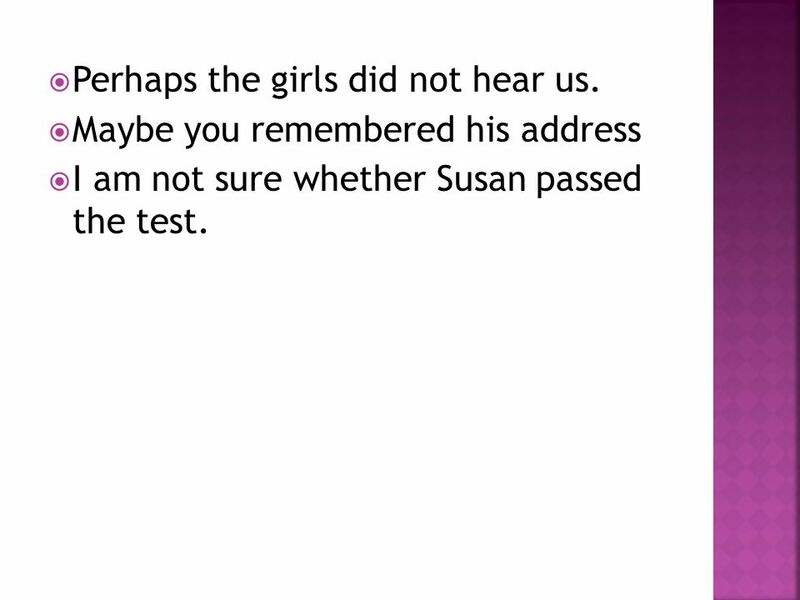 Maybe you remembered his address I am not sure whether Susan passed the test. After while as LINKING WORDS choose from the three given Ill think about you a lot ______ youre away. 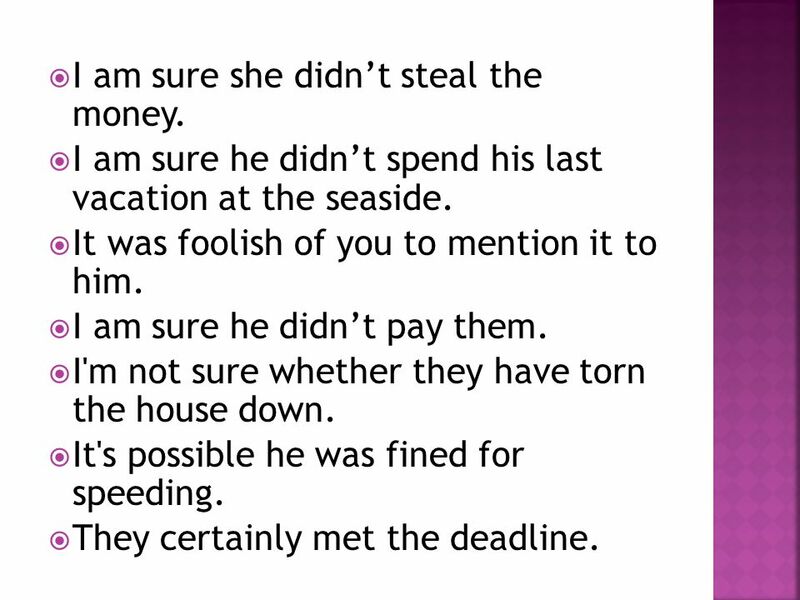 Common Mistakes in ENGLISH Teacher: Silvino Sieben 3ª Série EM. 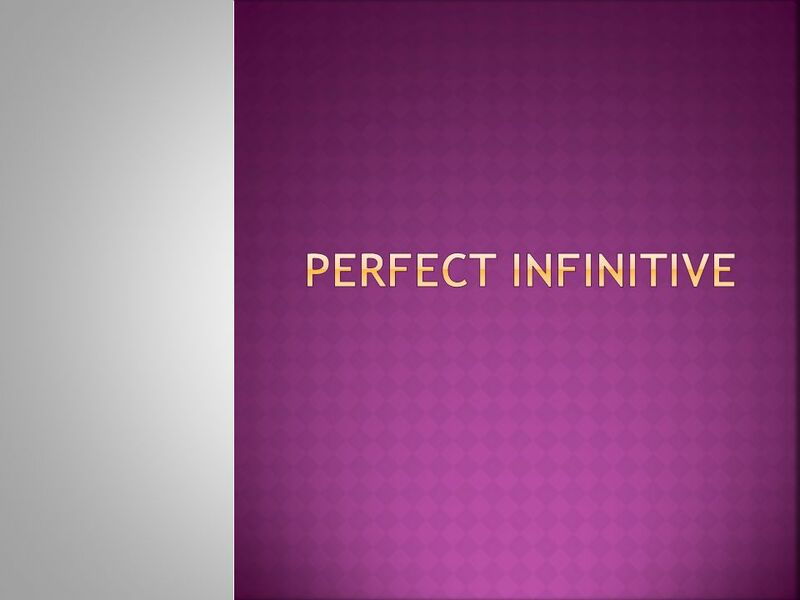 Irregular verbs Infinitive + Simple past. kopen - kocht I want to ---- a new sweater for myself buy Last week he a new pair of sunglasses bought. Hello class today I want to share my goals with you. We are soon going to be graduating s and we will have many goals in our life. So here are some of. 1.Why is he late? Please tell me________. Please tell me why he is late. 2. Would you please tell me ? When will you come? Would you please tell me when. My name is Shrek I am an Ogre I have a wife. I live in a swamp I have fought against a dragon A few years ago I married a princess My name is Shrek I.